Drymus brunneus, a brownish species and quite common. Even found in Scotland. 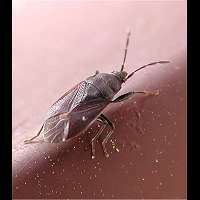 Drymus ryeii, a very dark species, usually with some brown markings on the wings. Not a common species in Britain, but found as far north as the Midlands. Drymus sylvaticus has a varying number of brown lines and patches on the front wing. Common in most places and even found in Scotland. Drymus latus is a brownish species, similar to Drymus brunneus, but often showing more contrast between the brown body and black thorax. A local species in Southern parts of England. Drymus pilicornis is similar to B. sylvaticus and a local species in Southern and Central England. Drymus pilipes is a rather rare species to be found in the Southern Parts of England only. Drymus pumilio is a very rare species found not too far from the Southern coasts of England only. The animal in the picture is very dark and rather unmarked. The picture has been given some extra light, to make more details visible. It is extremely difficult to put a name on. This page has last been modified on Friday, December 21, 2018.